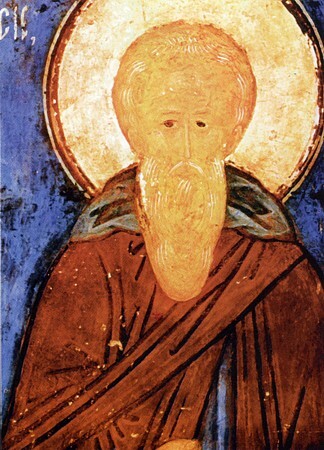 The Monk Theodosios the Great lived during the V-VI Centuries, and was the initiator of common-life (coenobitic) monasteries. He was born in Cappadocia of pious parents. Endowed with a splendid voice, he zealously toiled at church reading and singing. And the Monk Theodosios prayed fervently, that the Lord would guide him on the way to salvation. In his early years he visited the Holy Land and met with the Monk Simeon the Stylite ("Pillar-Dweller", + 459, Comm. 1 September), who blessed him and predicted future pastoral service for him. Yearning for the solitary life, Saint Theodosios settled in Palestine into a desolate cave, – in which by tradition, the three Magi had spent the night, having come to worship at the Nativity of the Saviour of the world. In it he dwelt for 30 years in great abstinence and unceasing prayer. Steadily there began to throng to the ascetic those wanting to live under his guidance. When the cave could no more hold all the gathered monks, the Monk Theodosios began to pray, that the Lord Himself would point out the place for the monks. Taking with him a censer with cold unlit coals, the monk went into the wilderness. At a certain spot the coals fired up and set the incense smoke to rising. Here also the monk founded the first common-life monastery, or Lavra [Greek "Laura" meaning "broad" or populous"; in Russia were four such: Trinity-Sergeev, Kievo-Pechersk, Alexander-Nevsk and Pochaev], under the ustav-rule of Saint Basil the Great (+ 379, Comm. 1 January). Soon the Lavra of the Monk Theodosios became reknown, and up to 700 monks gathered at it. According to the final testament of the Monk Theodosios, the Lavra rendered service to neighbour, giving aid to all the poor and providing shelter for wanderers. The Monk Theodosios was extremely compassionate. One time when there was a famine in Palestine and a multitude of people gathered at the monastery, the monk gave orders to allow everyone into the monastery enclosure. His disciples were annoyed, knowing, that the monastery did not have the means to feed all those who had come. But when they went into the bakery, they saw that then through the prayers of the abba, that it was filled with bread. And suchlike a miracle was repeated every time, when the Monk Theodosios wanted to give help to the destitute. At the monastery the Monk Theodosios built an home for taking in strangers, separate infirmaries for monks and laymen, and also a shelter for the dying. Seeing that at the Lavra were gathered people from various lands, the monk arranged for Divine-services in the various languages – Greek, Gruzian (Georgian) and Armenian. For communing the Holy Mysteries all gathered in the large church, where Divine-services were done in Greek. During the reign of the Constantinople emperor Anastasias (491-518) there arose the heresy of Eutykhios and Severus, which recognised neither the sacraments nor the clergy. The emperor joined in with the false-teaching, and the Orthodox began to suffer persecution. The Monk Theodosios stood firmly in defense of Orthodoxy and on behalf of the wilderness monks wrote a missive to the emperor, in which they denounced him and refuted the condemned heresy with the teachings of the OEcumenical Councils. He affirmed moreover, that the wilderness-dwellers and monks would firmly support the Orthodox confession. The emperor showed restraint for a short while, but then he renewed persecution of the Orthodox. The holy elder then manifest great zeal for the truth. Leaving the monastery, he came to Jerusalem and in the "Great" church, stood at the high place and cried out for all to hear: "Whoever honoureth not the four OEcumenical Councils, let them be anathema!". For this bold deed the monk was sent to prison, but soon returned after the death of the emperor. The Monk Theodosios during his life accomplished many healings and other miracles, coming to the aid of the needy. One time by prayer he destroyed locusts that were devastating the fields in Palestine; also by his intercession, soldiers were kept from perishing, and he saved both those perishing in shipwreck and those lost in the desert. One time the monk gave orders to strike the signal, so that the brethren would gather at prayer, and said: "The wrath of God draweth near the Eastern land". After several days it became known, that a strong earthquake had destroyed the city of Antioch at that very hour, when the monk had summoned the brethren to prayer. Before his death, the Monk Theodosios summoned to him three beloved bishops and revealed to them, that he would soon expire to the Lord. After three days he died at the age of 105, in the year 529. The body of the saint was buried with reverence in the cave, in which he lived at the beginning of his ascetic deeds.